Jamaica's team at the opening ceremony of the 23rd World Students' Chess Olympiad in Caracas, Venezuela, 7-22 August, 1976. 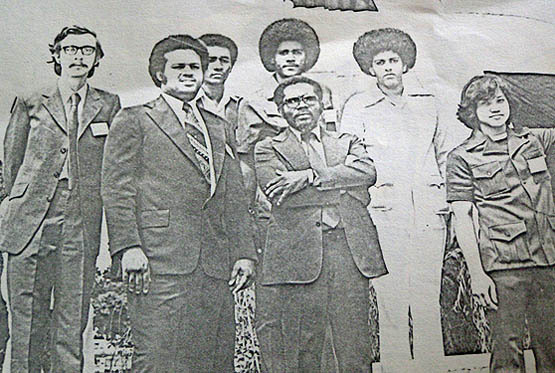 From left: Bob Wheeler, John Powell (deceased), Peter Mundell, David Hunt (deceased), Enos Grant (Captain/delegate, deceased), Orrin Tonsingh (deceased), and Sheldon Wong. National Master John Constantine Powell was a National icon on the Jamaican chess scene and set an example by becoming an active player in the last few years of his life. Tossing pride aside to provide younger players with life chess and a shot at beating a legend, Powell was the pride of Jamaican chess. Having represented Jamaica at nine Olympiad tournaments, he won a board four silver medal in the 1988 edition in Greece with 7/9. "Ironically, both John Powell and David Hunt represented Jamaica at the 23rd World Students' Chess Olympiad in Caracas, Venezuela in 1976, both died in the morning within days of each other, both of a heart attack, both will be buried on the same day with each having their funeral service at 10:00 am, and both John and David will be laid to rest at the Dovecot Memorial Park." Read Bertram Scott's photo essay here!